Increases in several retail categories were insufficient to off set weather-related factors and avert a minor drop in retail sales in December. For the entire year, however, retail sales increased, illustrating the continuing resilience of the U.S. consumer and providing the Federal Reserve confidence to normalize monetary policy. Currently, the central bank plans to raise its overnight lending rate to 1 percent in 2016, but will monitor domestic economic trends and foreign economies to potentially adjust its planned course. Total retail sales climbed 2.2 percent in 2015 despite a double-digit tumble in gas station sales for the entire year. A bright spot was spending at food service and drinking establishments, which surged 6.7 percent for the year, indicating consumers remain confident in the direction of the economy. Housing-related categories, however, were mixed. Sales of building materials and garden equipment jumped 4.2 percent last year as homeowners undertook home improvement projects, but furniture sales were up only slightly. A low homeownership rate and growing preference for rentals continue to suppress growth in this category. 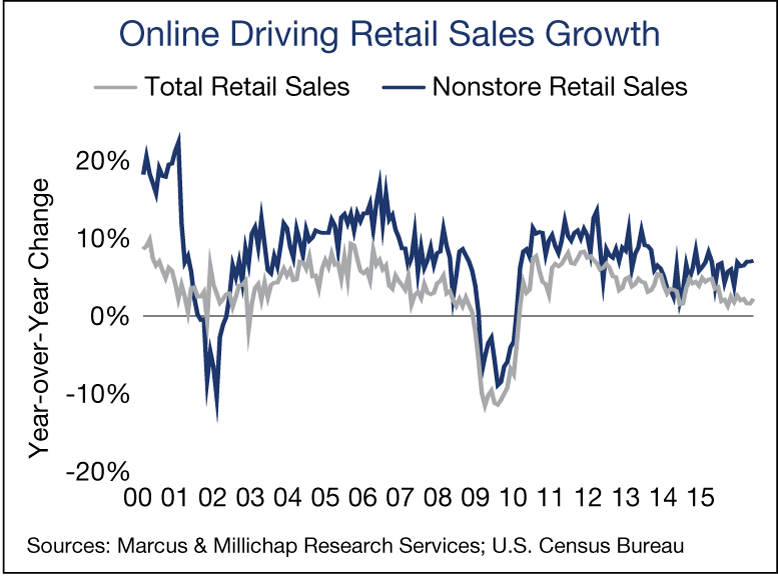 Including the 7.1 percent increase last year, online sales have expanded more than 50 percent since employers resumed hiring in 2010, far outpacing the 23 percent bump in store-based sales over the same stretch. Sales online rose 20 percent during the holiday shopping season, easily surpassing the results posted in other retail categories. The rise to prominence of sites including Amazon will continue to prompt a re-evaluation of traditional retailers’ strategies to reach consumers. As part of Macy’s recent announcement of store closures, the retailer also revealed it will build up its online presence. Prior to the Macy’s announcement, Saks Fifth Avenue disclosed it will purchase Gilt, a luxury goods e-commerce site. Gilt will maintain an online presence and also open some physical locations. Health and personal care stores are benefi ting from an aging population; spending in the category jumped 3.6 percent last year. Overall retail property vacancy was on track to fall to 6.1 percent last year as completions remained minimal and space demand grew; tighter vacancy was also supporting rent growth in the low-2 percent range. Some additional vacancy may arise, though, as Walmart shutters more than 150 U.S. stores, including 102 Walmart Express locations. The rise in the online retail segment continues to generate new demand for space for warehousing consumer goods and order fulfillment. Absorption of space by retail tenants contributed to a 30-basis-point decrease in U.S. industrial vacancy last year to 6.5 percent. An additional decline will occur in 2016 as demand rises and limited speculative space comes online. This entry was written by marcusmillichap, posted on January 18, 2016 at 7:22 pm, filed under Uncategorized. Bookmark the permalink. Follow any comments here with the RSS feed for this post. Post a comment or leave a trackback: Trackback URL.